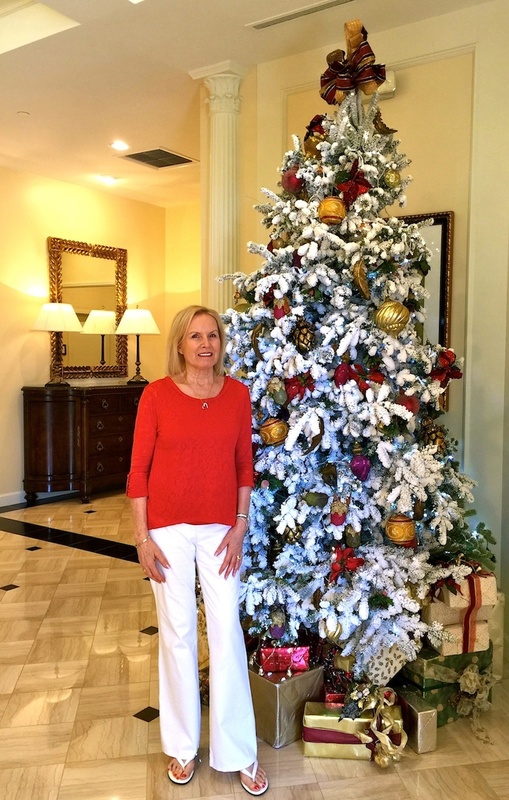 Ailsa’s Travel Theme this week is ‘Self’, so I got hubby to take this photo by the tree at the club. It wasn’t until I walked in and saw the Christmas tree, that I realised I was appropriately dressed in red and white and looked like Mother Christmas, or maybe that should be ‘Granny Christmas’ ….. note that there’s no beard. Oh! Such a beautiful picture, you and the tree sparkle! già fatto l’albero? non fai il Presepe? ossantacleopatra io devo ancora fare tutto ed anche mettere le luci fuori in giardino, sono scusata ero fuorie sono arrivata solo stasera.Coplimenti siete bellissimi, tu e l’albero! I think they wouldn’t do the Nativity scene here at our country club, because most of the members happen to be Jewish. They also have decoration for Hanukkah in the other corner of the foyer. what a lovely tree. Mine is still in its box and will only see day light from about the 16th. Beautiful Sylvia! You look very merry and full of joy! That is indeed a beautiful tree. Are you sure you are not Mrs Santa? Like you said, you are appropriately dressed. 🙂 Have a lovely pre-Christmas period. That looks fantastic with you! Have a wonderful Christmas time! Such a beauty — and the tree looks good, too. you are as elegant as the tree thoug not as decorated!! Very nice tree with that snowy boughs look. Christmas is definitely getting close. And this is a marvellous shot. Great. You make a wonderful Mother Christmas person. How very elegant Sylvia ! You look beautiful Sylvia! Like a Christmas ornament yourself. Far too young looking to be Mother Christmas! Two beauties- but especially you Sylvia! Thanks. Gunta. I don’t even have a mousy ache. You are a perfect match – both beautiful, dressed up in the right colours, he’s a bit taller than you and wearing a perfect beard. And – he’s loaded with presents! I’m giggling too, but you do look beautiful, Ad. 🙂 You’re sacrificing all that warmth and glamour for an English Christmas? Your color choice makes a lovely Christmas photo…Karma working in your favor. Appropriately clad, indeed, and a really good-looking tree. Yes, they always do a great Christmas tree here. Nope. Christmas trees in a warm climate just do not do it for me. I could never get used to it in South Africa. But you are looking good Sylvia! When do you get to England? I have to say that I’m not in the Christmas spirit yet. We get to England on 21sr. I love celebrating Christmas in Flip Flops! Wow…! U r beautiful sylvia… And that snowy tree also…!!! Nice picture. I’m beginning to feel a bit “Christmas-y”! Beautiful Sylvia – love the photograph! Have a wonderful weekend. Beautiful, Granny! 🙂 Have a blessed weekend, Sylvia! You do it very well.Chrismâs comes near.. in a few weeks she’s knocking at the door. You said it before me……but I agree. A pox on her with a thousand pounds of chocolate cakes and Christmas cookies.